On Tuesday June 28, Bridgewater and our staff were honored by the New York State Health Facilities Association (NYSHFA) at The Sagamore Resort in Bolton Landing, New York . 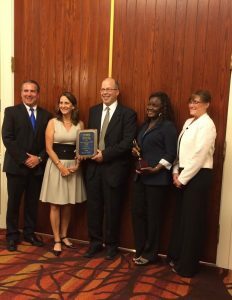 Catherina Belleau won the New York State LPN of the Year, and our Respiratory Therapy department received an Innovative Practice Award. The Innovative Practice Award was earned through our Respiratory Wellness Program which has greatly improved the lives of our residents and quantitatively shown significant improvements in terms of reduced hospitalizations and reduced reliance on medications. Pictured (left to right) are David Camerota – COO of USGNY, our parent company. Lisa Upham – Director of Respiratory Therapy and the brains behind the Respiratory Wellness Program. Kurt Apthorpe – Bridgewater Administrator. Catherina Belleau – NYS LPN of the Year. And MaryPat Carhart – Vice President of Clinical Service at USGNY.